Background: There are few publications specifically discussing the correction of tibial rotational deformities in adults; there are none to our knowledge that address very large deformities, exceeding 45°. We describe here a combination of reliable and predictable techniques for the safe correction of very large tibial rotational deformities. 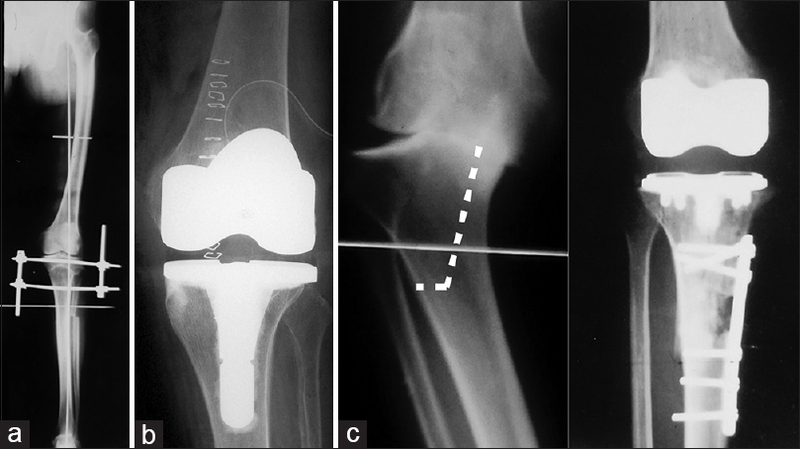 Methods: Retrospective review of a case series of eight adult patients who underwent correction of very large tibial rotational deformities following this surgical treatment protocol, with a minimum 2-year follow-up. These techniques included a formal peroneal nerve release, a subcutaneous anterior fasciotomy, a percutaneous Gigli saw corticotomy, an intramedullary nail, temporary circular external fixation, and gradual correction. The average magnitude of the preoperative rotational deformity measured 54° (45-65°). Seven of the patients had very large external rotation deformities; one had a very large posttraumatic internal rotation deformity (65°). Results: These deformities, all exceeding 45°, were successfully corrected to clinically neutral in eight consecutive cases. For all eight cases, the deformity was fully corrected within 2 weeks, and the patients returned to theater for a planned second minor procedure (locking screw insertion and external fixator removal) at an average of 9.6 (6-14) days after the index procedure. Patients were encouraged to resume full weight bearing by 6 weeks and all were walking unaided by 12 weeks. Clinical and radiographic union was achieved at an average of 15.5 (12-20) weeks. One case was over-corrected 5°; a second procedure was required to revise the deformity correction to clinically neutral. There were no other complications in this series. Conclusions: This combination of surgical techniques has, in this small series, been a consistently safe and effective treatment for this condition. Context: Ankle nonunions with deformity and bone loss are challenging cases, often with broken hardware and infection. These cases are often associated with multiple previous surgeries making revision surgery difficult. Ankle fusion for failed total ankle arthroplasty or neuropathic joints are particularly challenging, which is reflected in high reported failure rates. Aims: Fixator-assisted nailing combines Taylor spatial frame (TSF) with an intramedullary nail, allowing for correction of deformity and compression at the nonunion site, as well as internal fixation protecting the fusion after frame removal. Subjects and Methods: Between 2001 and 2014, 24 patients with 26 failed ankle fusions, with bone loss and deformity, were treated using this technique. After removal of the original internal fixation hardware and revision of the fusion surfaces, a Taylor frame is used for acute or gradual correction of deformity and compression at the nonunion site. This was followed by insertion of intramedullary nail. The nail was locked at the time of fixator removal. Results: Acute correction was possible in 23 of the 26 cases with gradual correction in the others. Union was obtained in 25 cases (96.2%) and maintained at 24 months in 23 cases (88.4%). The overall salvage rate (avoidance of amputation) was 96.2% (25/26 cases). 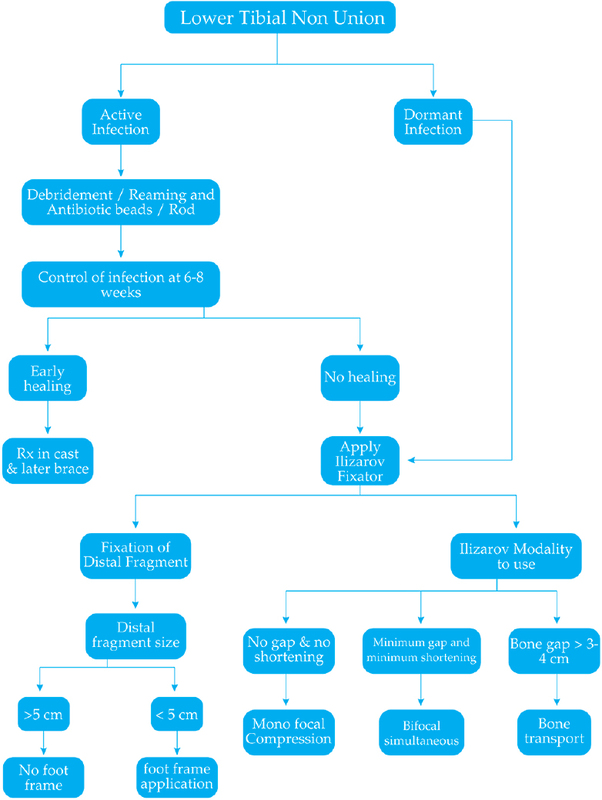 All salvaged limbs remain free of clinical infection and do not require ongoing antibiotic treatment. The foot was in neutral position in all salvaged cases. The average time in external fixation was 11 weeks (6-13 weeks). The average AOFAS ankle/hindfoot score was 74 (range: 61-80). 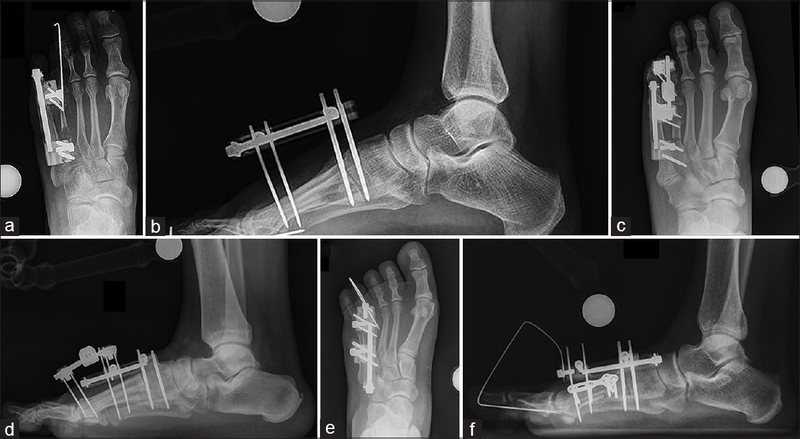 Conclusions: Fixator-assisted nailing, combining a TSF and an intramedullary nail, is a reliable technique for revision ankle fusion for complex nonunion with deformity and/or infection. Aims: To retrospectively study infected distal tibial nonunions which have deformity, bone gaps and a small size of distal fragment for union and eradication of infection using staged Ilizarov treatment. Patients and Methods: Thirty seven distal infected tibial nonunions were treated over 11 years. Twelve presented without active discharge and were treated with Ilizarov fixator. Twenty five presented with draining infection and were treated with debridement, Antibiotic Cement Coated (ACC) rods and beads. Five healed without further intervention. Twenty were treated by Ilizarov fixator secondarily. Monofocal compression was used in 16 patients. Ten had a bone transport to fill gaps of 2 to 17.3 cm. Six had bifocal simultaneous treatment. Twenty three had a foot frame applied for stability. None had Iliac Crest bone grafting to achieve union at Nonunion site. Bone Marrow aspirate was injected in 5 patients to hasten union. Results: Five patients united without application of fixator. Twenty nine of 32 nonunions healed with first application of Ilizarov fixator. Three needed repeat fixation to achieve 100% union. Infection was eradicated in all patients. Thirteen (40%) were excellent, 14 good (43%), two were fair and three poor by ASAMI criteria. Mean ex-fix duration was 393.4 days (132-720). Mean 7.6 cm length was achieved in the regenerate. Conclusions: Infected Distal tibial nonunions have a small distal fragment, deformity, bone gap causing difficulties in treatment. Debridement, ACC beads and rods and Ilizarov fixator reliably achieves union and eradicates infection. Residual deformity and prolonged fixator duration were the main problems in our series. Background: Distraction osteogenesis (DO) using external fixation has revolutionized the management of brachymetatarsia, yet not without complications (30-100% incidence), the most common involving the metatarsophalangeal (MTP) joint. Questions/Purposes: What are the clinical outcomes of DO for brachymetatarsia? What are the challenges and outcomes particularly related to the MTP joint? Does the method of stabilizing MTP joint during DO affect the outcome? Materials and Methods: This is a retrospective study of 44 metatarsals (MTs) in 27 patients who underwent DO. Regarding MTP joint stabilization; 43% were fixed with K-wire across the joint, 32% with pinning of phalanges short of joint and attaching the K-wire to the external fixator, 7% by pinning of phalanges and distraction arthroplasty of the MTP joint, 2% no stabilization, and 16% by other methods. Clinical outcomes were analyzed by a nonvalidated 9-item questionnaire at the latest follow-up in addition to a review of postoperative radiographs. Complications, particularly pertaining to MTP joint were recorded. Statistical Analysis: The paired t-test was used to assess the difference in MT length. Fisher's exact test used to evaluate rates of complications by MTP fixation method. McNemar's test was used to measure the difference in outcome questionnaire responses. Cochran-Armitage trend test was used to assess differences in toe-limitation before and after surgery. Results: Postoperatively, MT length showed a significant increase of 12.98 ± 3.74 mm (28.55 ± 9.25%). Problems included MTP stiffness in 64%, MTP subluxation in 27%, and MTP dislocation in 7%, with no significant differences in outcome by MTP joint stabilization. Satisfaction with surgery was reported by 95% of patients. Conclusion: DO is an effective treatment for brachymetatarsia, with high patient satisfaction. The most commonly reported problem was MTP joint stiffness with no functional deficit. There was no significant difference in the rate of MTP joint-specific complications by stabilization method. Larger patient numbers are required for validation of an optimal MTP joint stabilization method. Level of Evidence: IV, Case Series. The medial compartment osteoarthritis (OA) of knee joint has various surgical options such as high tibial osteotomy (HTO), hemiarthroplasty, and total knee arthroplasty. In the early stages of medial OA, there are no intra-articular deformities. Thus HTO, which is an extra-articular osteotomy, is recommended for the treatment of mild OA, but in moderate and severe medial OA, there are intra-articular deformities. HTO cannot correct these intra-articular deformities. Thus, an intra-articular osteotomy like the Tibial condylar valgus osteotomy (TCVO) is required in cases of moderate to severe medial OA knee. The contact area of the articular surface of the knee joint after TCVO is broader than it is after HTO in cases of moderate/severe OA. TCVO also improves the bony stability, eliminates the lateral thrust and surely corrects the alignment of the lower limb. To conclude, in cases of medial OA knee, the type of deformity must be evaluated and corrected accordingly. Intra-articular deformity must be corrected first. If the correction of varus and the mechanical axis is not enough, then extra-articular deformity must also be corrected, with a simultaneous or subsequent HTO. Complex foot deformity correction with conventional techniques has many limitations including neurovascular problems, skin problems, stiffness, and limb shortening. Ilizarov methodology on the contrary is not limited by deformity magnitude and permits a comprehensive approach to foot deformity correction treating all deformities simultaneously, either in foot or leg, combining techniques of soft tissue distraction, bone lengthening, and arthrodesis. Nevertheless, Ilizarov methodology is not exempted from problems and difficulties. It is a technically demanding procedure with a long learning curve. For the patient, treatment time is long, the frame is uncomfortable, pin infection is frequent, and other complication rates are also high. However, if proper technique is used including preoperative planning, preconstruction of the frame, careful ambulatory handling, and this method can be useful in the management of difficult cases and in certain circumstances, the sole method to correct complex foot deformities. Fractures of the talar body often result from high-energy trauma. These fractures are at risk for nonunion and put the talus at risk for avascular necrosis due to an inadequate blood supply. We present the case of a 57-year-old male that presented to our practice with talus fracture nonunion, talar body osteonecrosis, ankle and subtalar posttraumatic osteoarthritis, and deformity including a mild equinus contracture and mild hindfoot varus. 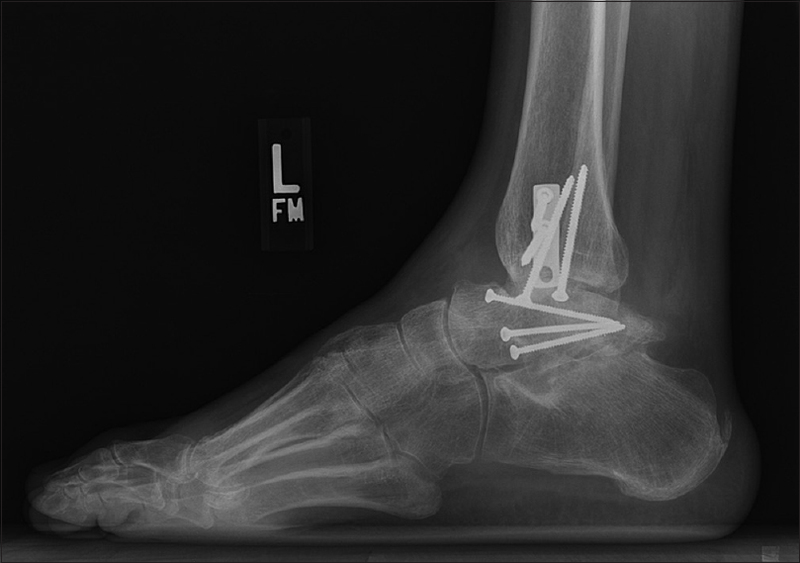 Successful ankle and subtalar fusion, talus fracture union, and deformity correction were performed using a circular external fixator with fine wire fixation and compression. This is the first reported case where fusion of both the tibio-talar-calcaneal joints and the talar body nonunion was achieved using external fixation. At the time of this report, the patient is over 3 years postfusion, stands with neutral alignment, is relatively pain-free, is able to resume normal daily activities, and has no progression of talar osteonecrosis.